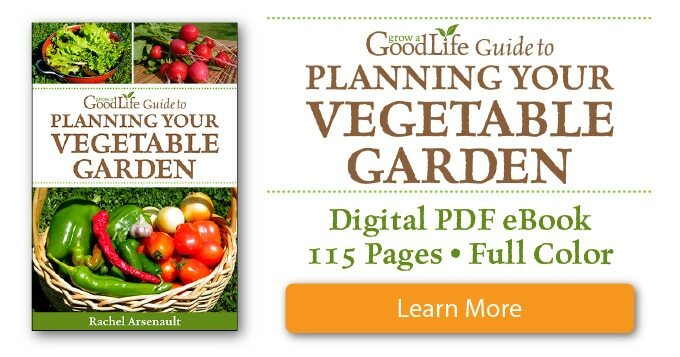 Do you want to grow and preserve your own vegetables, but worry that you won’t have the time to tend to your garden? No problem! 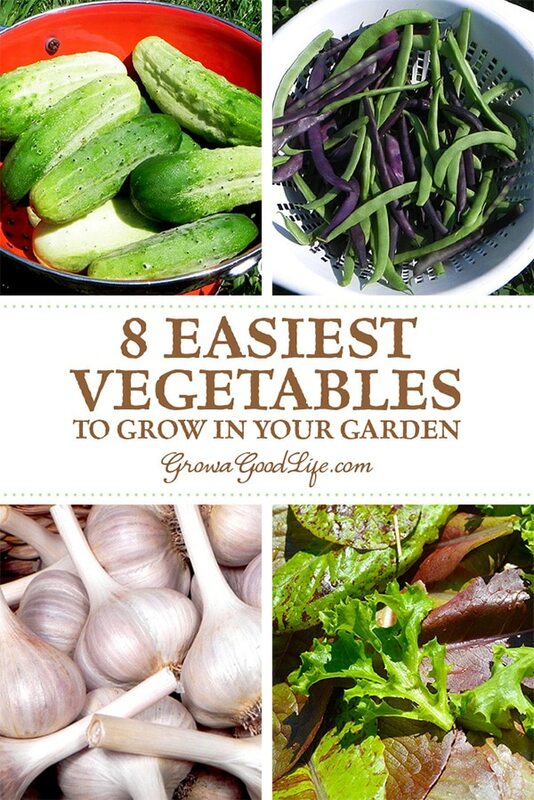 There are plenty of vegetables that won’t take a lot of effort to grow. Whether you are new at gardening, pressed for time, or just want to grow a vegetable garden with the least amount of effort, these are some of the easiest vegetables to grow. 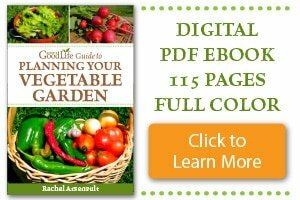 When to Plant Your Vegetables? Most vegetables are classified under two categories, cool season and warm season crops. Grow cool season crops in early spring and fall. 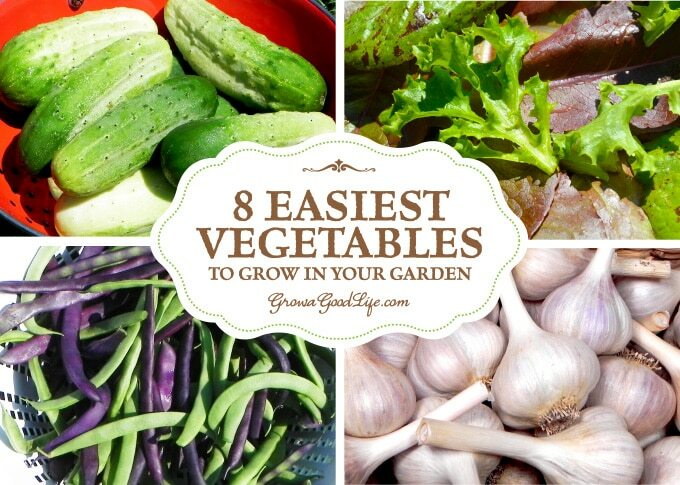 These vegetables can handle light frosts and thrive in the cooler part of the growing season. Warm season crops are killed by frost and need warm soil and high temperatures to grow. Plant warm season crops in the summer after the danger of spring frosts has passed. Look up your frost date by zip code here: PlantMaps.com. These 8 easy vegetables to grow are simple to maintain and don’t need a lot of attention other than watering and harvesting. 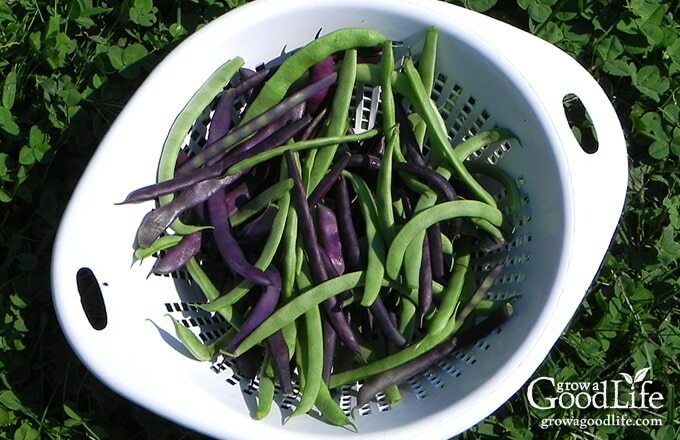 With so many varieties, shapes, and colors, you are sure to enjoy growing beans. You can grow string beans for fresh eating or dried beans for food storage. There are two basic types of bean plants, bush beans and pole beans. Both have their advantages. Pole beans grow long vines before they begin to blossom and produce beans. Provide pole beans with a sturdy trellis and they will wrap themselves around and up the support as they grow. Pole beans continue to vine and produce for a longer period of time than bush beans. They are easier to harvest than bush beans because they are upright and easy to find. Bush beans are compact plants that grow and produce beans quickly, usually within 45-50 days after sprouting. Succession planting every 2 weeks will keep your bush beans going longer. Other than watering when the soil is dry, bush beans don’t need much attention except to harvest when ready. Bush beans are usually ready all at once, making them a perfect choice for preserving. Sow bean seeds once the soil warms in spring, about a week after your last frost date. Plant seeds 1-inch deep and 4 inches apart in rows about 2-3 feet apart. Provide a sturdy support for pole beans to climb. Harvest both pole and bush beans when the pods are young and tender. Pick string beans often to help promote more growth and increased yields. Dry beans or shelling beans are grown to full maturity. Harvest when the pods have matured and turned brown. This summer vining crop loves to sprawl, so give it plenty of room in your garden or consider growing vertically. Growing cucumbers upright on a trellis not only saves space, but also helps keeps the fruit clean and easier to pick. There are two main types of cucumber: slicing and pickling. Depending on the variety, slicing cucumbers are about 8-inches long and have thick, dark-green skin, and tapered ends. They are delicious in salads and on a vegetable platter. 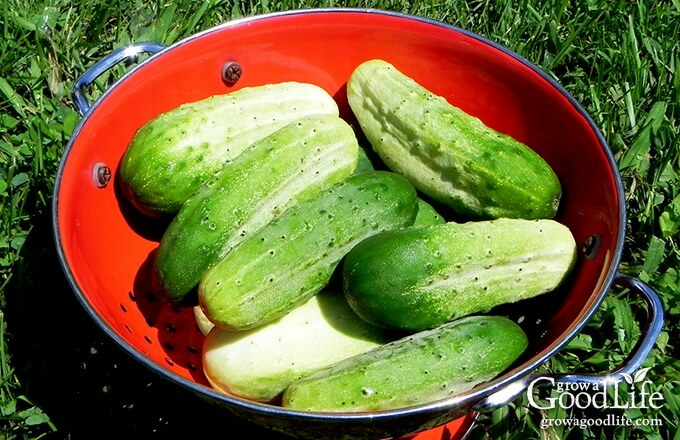 Pickling cucumbers are smaller, thin skinned, mild flavored, and stay crisp when pickled. Sow seeds once the soil warms in spring, about a week after your last frost date. Plant seeds 1-inch deep and 6-8 inches apart in hills about 4 feet apart. Thin down to three plants per hill and let the cucumber vines sprawl all over. No thinning is needed if you are growing on a trellis. You may need to guide the plants to the trellis when they are small, but once their tendrils wrap around the upright support, the vines will climb up as the plant grows. If you are tight on space or want to grow cucumbers in containers, seek out compact bush varieties and sow 1-2 plants in a large, 5-gallon pot. Plants in containers tend to dry out quickly, so water frequently during hot, dry temperatures or consider planting in a self-watering container. Garlic is one of the easiest crops you can grow in your garden. A small amount of preparation at planting time will give you a great garlic harvest with not much effort. Choose varieties that grow well in your area. In the north, plant garlic 6-8 weeks before your estimated hard frost date in fall. In southern areas, plant your garlic in February or March. Garlic bulbs grow from individual cloves of the bulb. Separate the cloves and plant your garlic 6-inches apart and 4-inches deep. Water well and add a light layer of mulch to keep the weeds down until the ground freezes. Add another layer of mulch after the ground freezes to insulate and prevent the garlic roots from being heaved out of the ground by alternate freezing and thawing. Each clove will grow a new head of garlic. 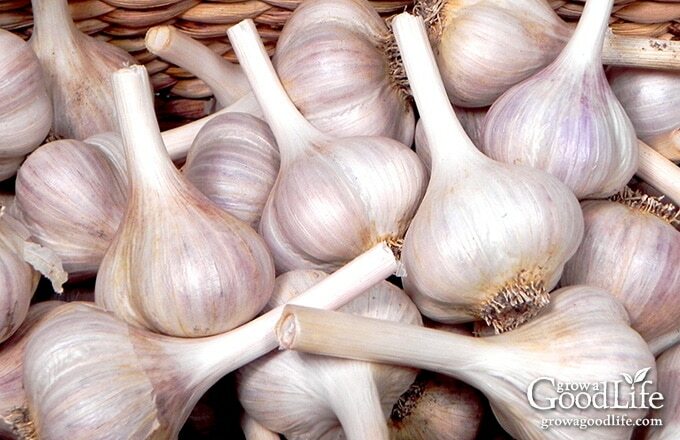 Read How to Plant Garlic in Fall for more detailed information. If you are growing hard neck garlic, it will give you two harvests. A few weeks before the garlic bulbs finish growing, they will send up a flower stalk. This stalk is called a “garlic scape.” Harvesting the garlic scape helps the plant focus its energy on growing a bulb. The garlic scapes are edible and have a delicious, mild garlic flavor. This cool season crop is so easy to grow and takes up very little space. There are hundreds of varieties, colors, and leaf shapes to keep your salads interesting. You can grow lettuce from seed and harvest tender, loose-leaf greens in as little as 30 days. Let heading lettuce mature and harvest the whole plant at once in about 60-80 days. Growing lettuce in containers eliminates some of the challenges such as weeds and pests. Place the containers close to the house where you can water and harvest as needed. Lettuce prefers cooler weather of spring and fall. It will turn bitter and bolt, or go to seed if the temperatures are too warm. Lettuce grows healthier with some shade from direct sunlight. Sow seeds 1/4-inches deep and keep soil evenly moist. Sow seeds every two weeks for a continuous harvest well into summer. Lettuce has a shallow root system, so water frequently or grow in self-watering containers. 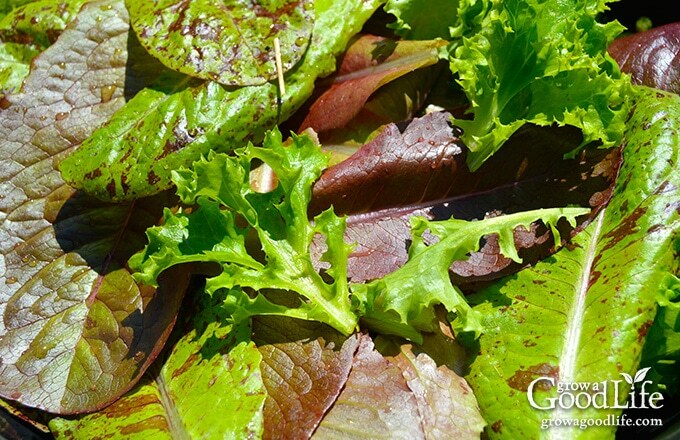 Harvest leaf lettuce by snipping the outer leaves and let the plant continue to grow and produce more foliage. Harvest heads of lettuce by cutting the stalk at the soil surface. Scallions are small green onions that don’t form a bulb. They are many types of scallions. Some are biennial and will multiply and come back year after year. My favorite standby is Evergreen Bunching Onions. It grows quickly from seed to provide fresh onions for meals as needed. If there are any bunching onions left in the ground at the end of the season, they overwinter, and begin multiplying the following spring. Growing scallions from seed is so easy. Select a sunny, well-drained location and sow seeds as soon as the ground can be worked in the spring. Plant seed 1/4 inches deep, about 2-inches apart. Scallions have a shallow root system, so water frequently until they become established. Harvest scallions as soon as they are large enough to eat. For early crop start seeds indoors under lights 8-12 weeks before planting in the garden. 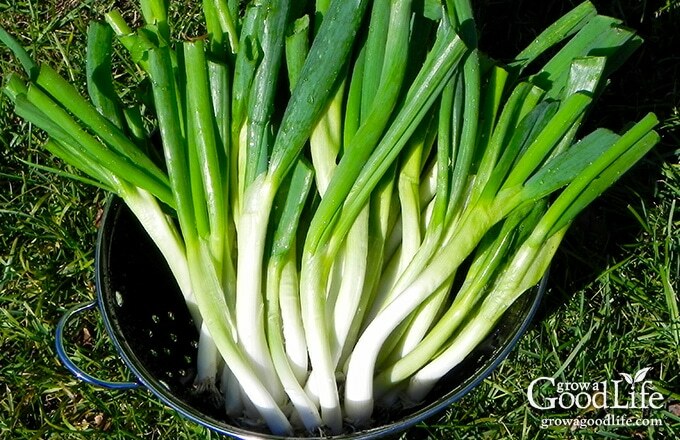 Scallions have a mild onion flavor and can be enjoyed in stir-frys, salads, or in any recipe that you would use normally use onions. These sun loving, summer vegetables need space to grow, but you will find that just one or two plants will give you plenty to harvest throughout the growing season. Summer squash, also called courgettes, are grown for immature fruits, which can be harvested all summer long. 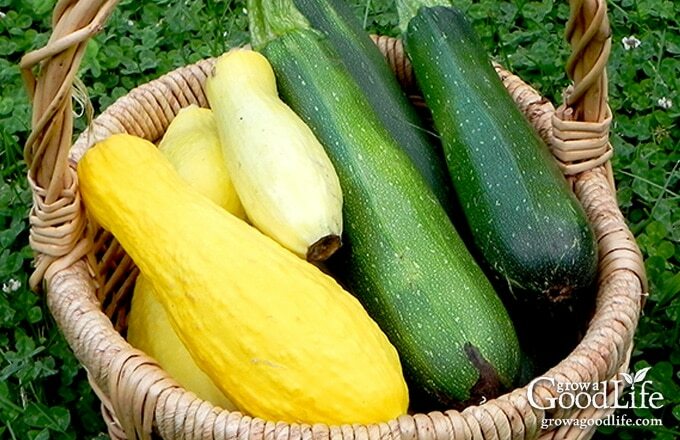 The summer squash family includes many varieties of shapes, sizes, and shades of yellow and green. Popular summer squashes are zucchini, pattypan, and yellow crookneck. Sow seeds in hills once the soil warms in spring, about a week after your last frost date. Plant 1-inch deep, and 6-8 inches apart. Space your hills 4-6 feet apart depending upon the size of the fruit. Thin down to three plants per hill. Also consider growing summer squash vertically to save space in your garden. Heat loving summer vegetable with many, many varieties, colors, and shapes. Some are easier to grow than others. 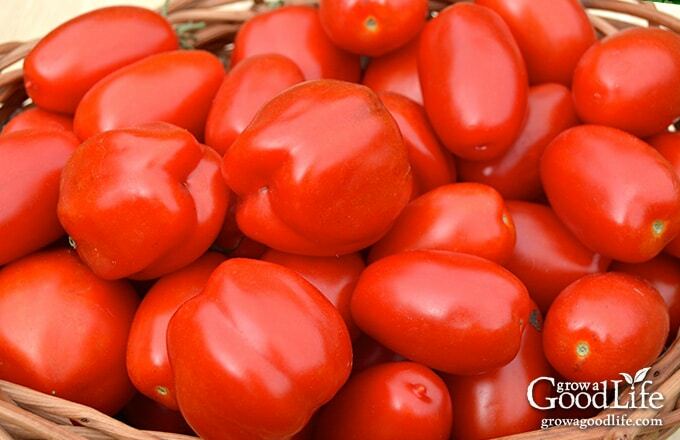 The easiest tomatoes to grow are determinant or bush varieties with some disease resistance. Bush varieties are bred to grow compact plants that are about 2-4 feet tall and need minimal support. Tying the main stem of the pant to a stake or using a large tomato cage is generally sufficient to support their growth and keep the fruit and vines off the ground. Bush tomatoes are easier to grow because you won’t have to spend time tying them to a trellis or pruning out extra suckers, or branches as the plant grows. Since they grow on compact plants, the fruit tends to ripen all at once. Perfect for preserving a tomato sauce or salsa. Alternatively, indeterminate tomatoes need a sturdy, tall trellis support. If you have the time, and are willing to put in the effort, you will be rewarded with a longer harvest. Purchase transplants from a nursery or start your own plants indoors. If you are growing your own, sow seeds indoors, under lights about 6-8 weeks before your last frost date. Pot up to larger containers, harden off, and transplant into the garden when the soil warms, about 2 weeks after your last frost date. Once winter squash plants become established in the spring, the plants don’t require much attention until the end of the growing season when it is time to harvest. Some common varieties of winter squash include: Acorn, Butternut, Hubbard, Spaghetti, and Pumpkin. Winter squash loves to sprawl, so allow plenty of space for the vines to grow. Sow seeds in hills once the soil warms in spring, about a week after your last frost date. Plant 1-inch deep, and 6-8 inches apart. Space your hills 4-6 feet apart depending upon the size of the fruit. Thin down to three plants per hill. Keep watered until the plants begin to grow, then let the plants sprawl out. The vines will run in every direction. Blossoms will form along the vines, and the fruit will begin to grow. 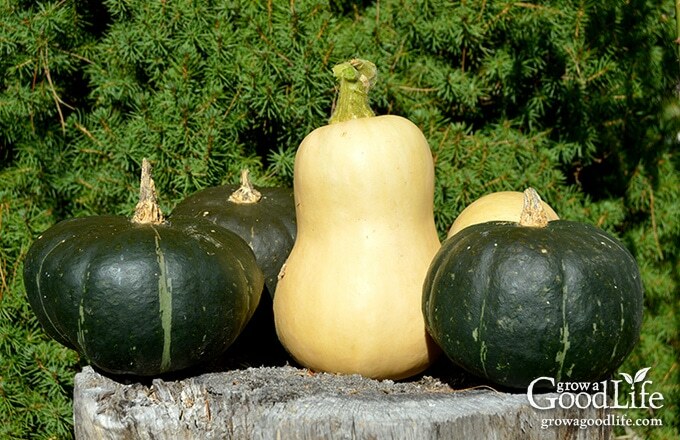 Winter squash matures in 60-110 days depending on the variety. Harvest ripe squash at the end of the season before frost. Winter squash is ready to harvest when the rind can’t be dented with your fingernail, and the stems are hard and dry. Leave the squash in the garden to field cure in the sun for about a week, then store in a dry, cool location. Most winter squashes will keep for several months in storage. Freshly harvested produce grown organically without chemicals and pesticides is much better for your health. Growing your own, even on a small scale, lets you know exactly where your food is coming from.